We got exceptional service/care here. Five vials of blood were drawn to do more sensitive testing, for Sezary cells and other markers. Bob will have a PET/CT scan to check for lymph involvement and other issues. Dr. R will call us on the 18th, and based on these results they will confirm the staging and establish a treatment plan. I was shaken by the stage III assessment, but UPenn commonly sees stage III and IV patients. Dr. R told us that the disease has an unpredictable progression but many patients respond well to the first lines of treatment. She considered Bob's disease to be a faster onset (which is not ideal) but he is in great physical shape (which is good). We learned that the kind of chemo that works on some cancers does not work for CTCL -- as soon as the chemo stops, the disease comes right back. The strategy is to treat with "low toxicity" drugs that keep the disease under control. Bob will be on drugs to manage this for the rest of his life or until they find a cure. 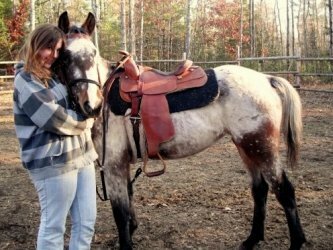 Here is young Ponder under saddle with her loving owner. Great life story, so far, huh? Prayers for you and Bob. Hope you can get some horsey hugs soon. Keeping Bob and you in my prayers as well. Sounds as if Penn is on top of things with a high level of expertise and experience with this. Not the ideal report, but certainly encouraging to hear that results from treatment are usually very good. Sending more hugs your way.